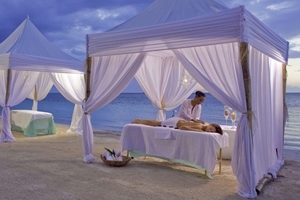 Allow the wisps of the refreshing West Indies breeze swirl around your person as you bathe under a beautiful Caribbean sun at the Luxury Included® Sandals Montego Bay. 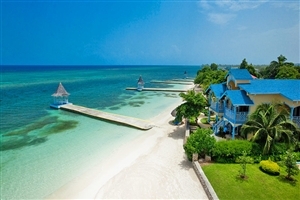 Set on the paradisiac stretches of Jamaica’s coastline, Sandals Montego Bay represents an excellent choice for a Caribbean holiday with its laid-back ambience and romantic touches, while guests will receive the utmost personal service from the moment they arrive to the moment they depart. 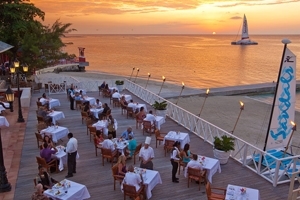 With 9 superb restaurants, oceanfront swimming pools, tropical gardens and Sandals’ exclusive Butler Service, Sandals Montego Bay is the ultimate place to unwind. 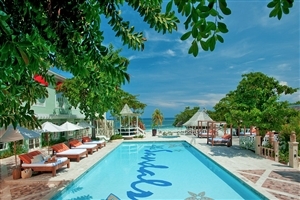 Located on the longest private white sand beach in Jamaica and with all rooms merely steps from the water's edge, this Luxury Included® getaway is the first Sandals resort and is still a favourite. 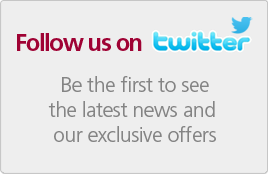 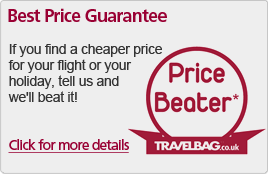 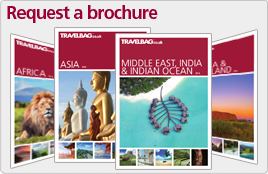 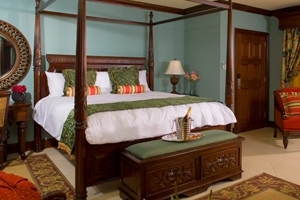 Choose from a huge selection of room types offering exquisite decor and mahogany furnishings. 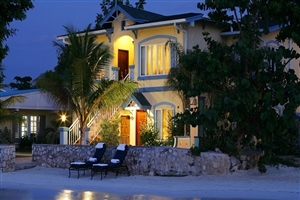 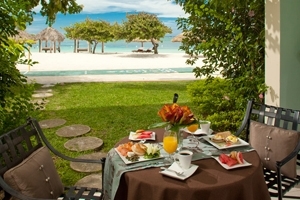 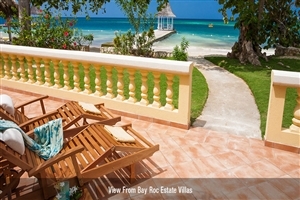 Upgrade to the Bay Roc Villa Suites set directly on a secluded beach, with the added benefit of personal Butler Service. 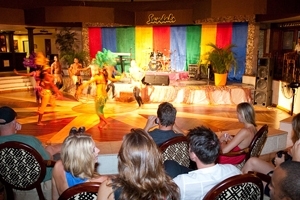 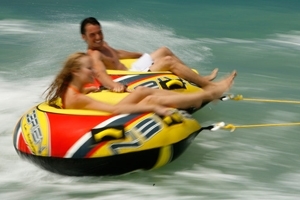 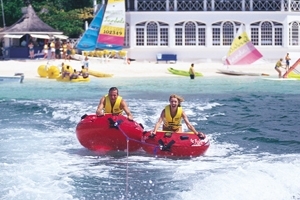 Nine delicious restaurants including a traditional British pub, as well as 4 bars, create a lively atmosphere at this fun resort, which also boasts a wide variety of entertainment choices, the relaxing Red Lane® Spa (extra cost for treatments), exciting land sports and an extensive range of watersports. 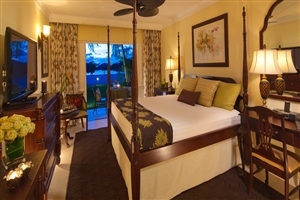 The Caribbean Deluxe Room at Sandals Montego Bay features a king-size bed and enjoys pleasant views across the main swimming pool deck. 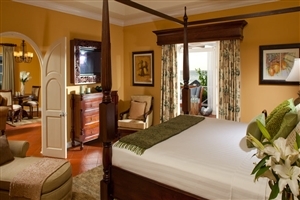 The Caribbean Luxury Room at Sandals Montego Bay is located close to the Piano Bar and Swim-up bar, with a pleasant private balcony overlooking the manicured gardens. 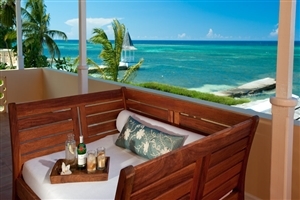 The Caribbean Oceanview Luxury Room at Sandals Montego Bay offers fabulous views across the Caribbean Sea from its private balcony. 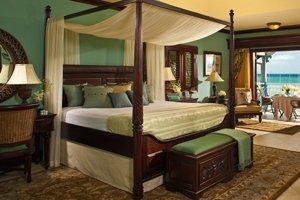 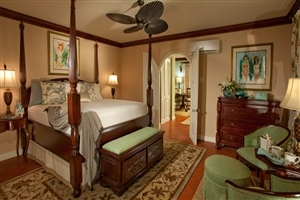 Features in the newly-renovated room include a four-poster king-size bed. 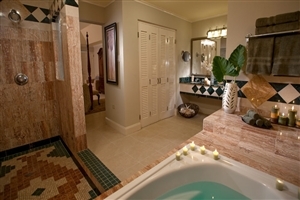 The Oceanfront Honeymoon Club Level Room with Balcony Tranquility Soaking Tub at Sandals Montego Bay is elegantly designed with aquatic overtones that come together with a soothing soaking tub and a private balcony that boasts of oceanfront views to appeal to all visitors. 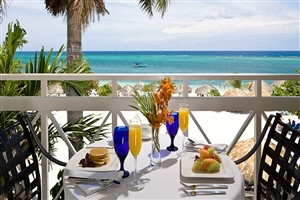 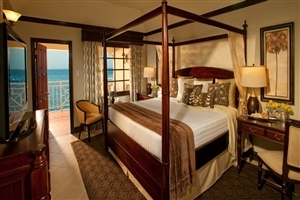 The Oceanfront Honeymoon Walkout Club Level Room with Patio Tranquility Soaking Tub at Sandals Montego Bay offers fabulous ocean views from the private patio, while romantic upgrades include a lavish soaking tub in the and aquatic tones all throughout the open-planned setting. 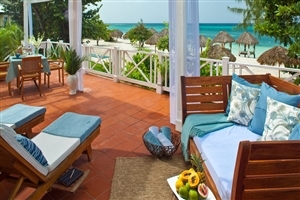 The Oceanfront Swim-up Butler Suite w/ Patio Tranquility Soaking Tub at Sandals Montego Bay is located on the garden level of the Almonds building and boasts a swim-up river pool, a private patio and stunning oceanfront views to entice travellers the world over. 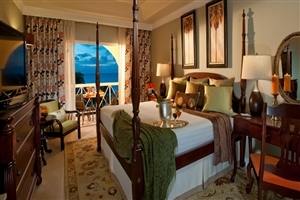 The Bay Roc Beachfront One Bedroom Butler Village Suite at Sandals Montego Bay feature an expansive living and bedroom area, plus Sandals’ exclusive butler service. 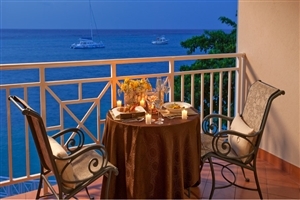 The Bay Roc Beachfront Oversized Butler Villa Suite at Sandals Montego Bay is located on the upper level with a balcony or ground level with a patio. 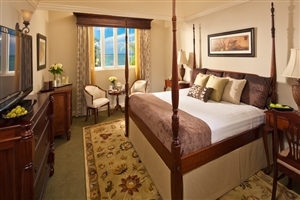 The Suite features a living room and bedroom, plus views across the beach, ocean and gardens. 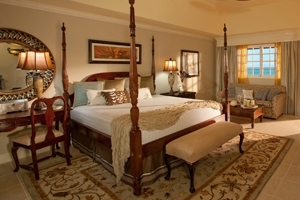 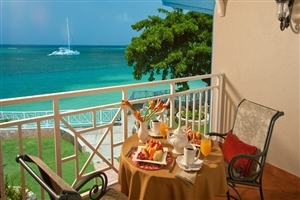 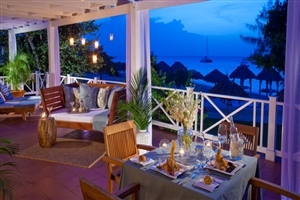 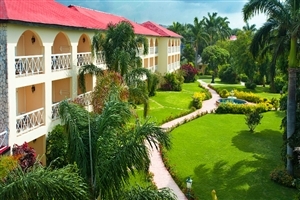 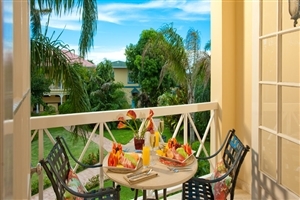 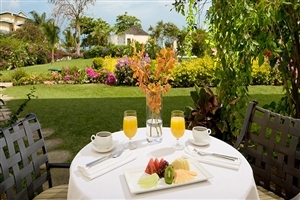 The Bay Roc Beachfront Royal Butler Villa Suite at Sandals Montego Bay is located on the upper level with a balcony or ground level with a patio. 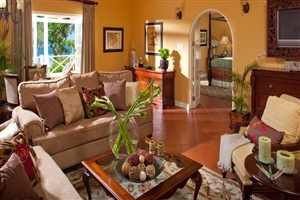 The Suite features a large living room and expansive bedroom. 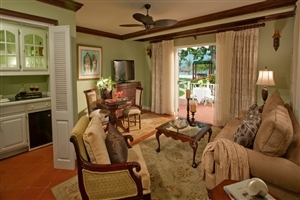 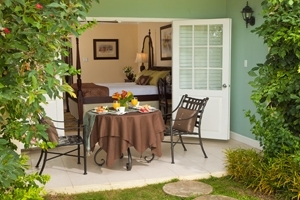 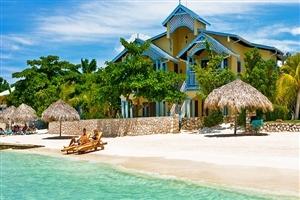 The Bay Roc Beachfront Presidential One Bedroom Butler Village Suite at Sandals Montego Bay is located on the first floor of the cottages at Bay Roc Estates and features a separate living room and bedroom. 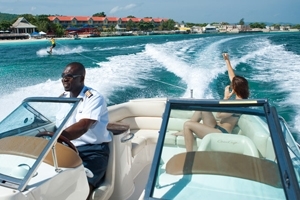 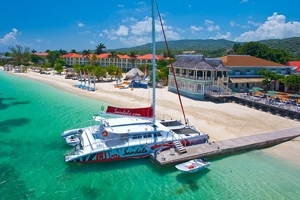 Guests staying in the Suite will receive VIP transfers to and from the airport, Sandals’ exclusive butler service and access to some of the more secluded stretches of Montego Bay. 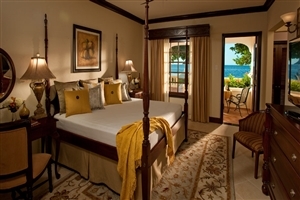 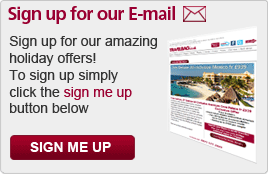 The Bay Roc Beachfront Prime Minister's One Bedroom Butler Villa Suite at Sandals Montego Bay is an expansive accommodation choice with its spacious living room, bedroom and dining area. 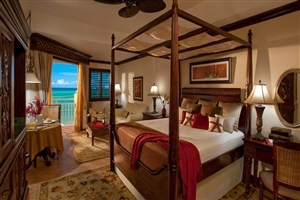 The Suite is located on the beachfront for direct access to the golden sands, while upgrades include VIP transfers to and from the airport and Sandals’ exclusive butler service. 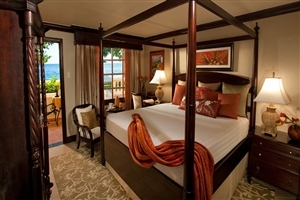 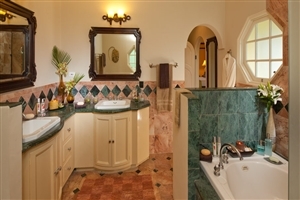 The Beachfront Romeo & Juliet One Bedroom Butler Villa Suite with Outdoor Tranquility Soaking Tub at Sandals Montego Bay is an idyllic accommodation specially designed for couples with its romantic overtones, lavish comforts and generous amounts of space. 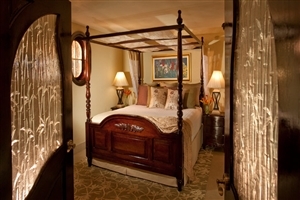 The suite features a balcony and a patio as well as a private tub to help enhance the intimate ambiance of this exquisite setting. 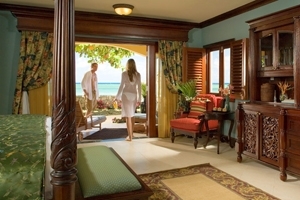 The Beachfront Honeymoon Grande Luxe Club Level Room at Sandals Montego Bay is offered with Sandals’ exclusive concierge service, plus elegantly appointed décor that creates a sophisticated ambience. 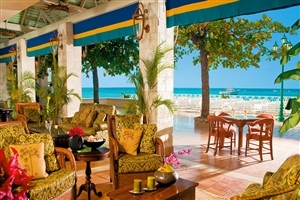 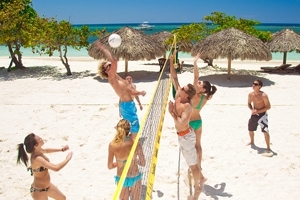 The Beachfront Walkout Club Level Room at Sandals Montego Bay is located on the first floor with a patio offering direct access to the golden sand beach and the ocean beyond. 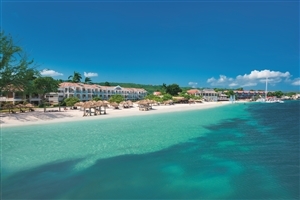 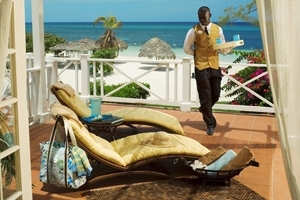 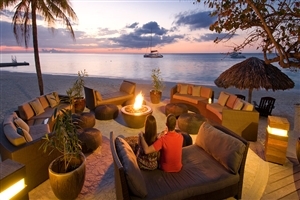 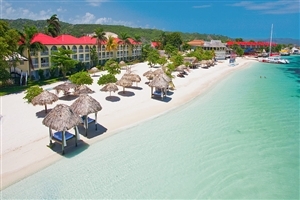 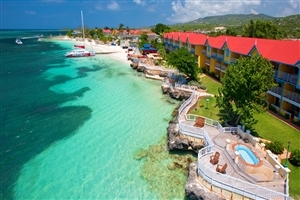 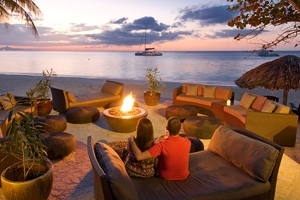 The Beachfront Honeymoon Walkout Club Level Room at Sandals Montego Bay is located on the first floor with a patio offering direct access to the golden sand beach and the ocean beyond. The Bay Roc Beachfront Butler Village Junior Suite at Sandals Montego Bay features elegant mahogany furnishings, a whirlpool bathtub and pleasant beach views from the private balcony. 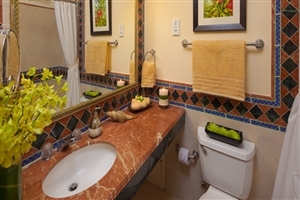 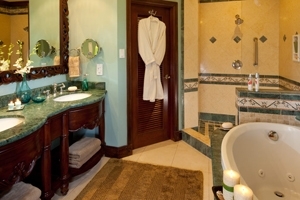 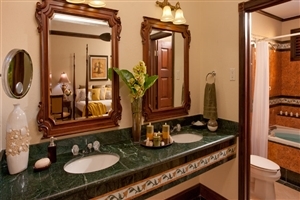 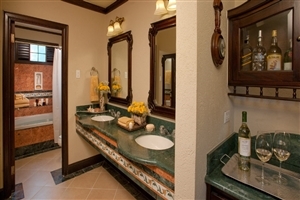 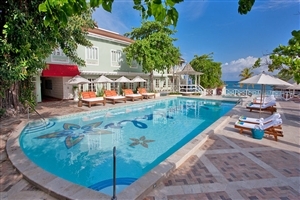 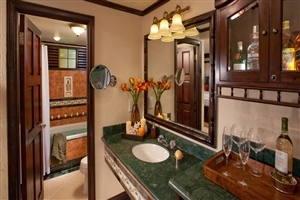 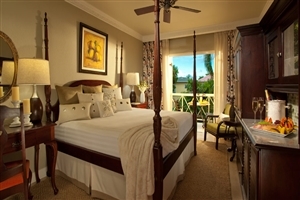 The Bay Roc Beachfront Walkout Butler Village Junior Suite at Sandals Montego Bay features elegant mahogany furnishings, a whirlpool bathtub and direct access to the beach from the patio. 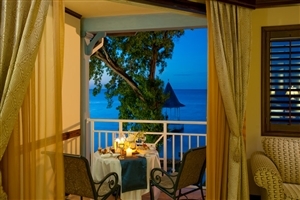 The Bay Roc Beachfront Butler Village Suite at Sandals Montego Bay is located on the upper level or ground level at Bay Roc Estates, set on the beach and sharing an extended patio. 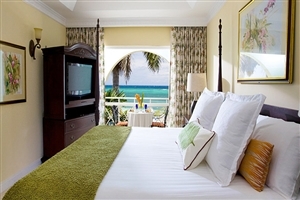 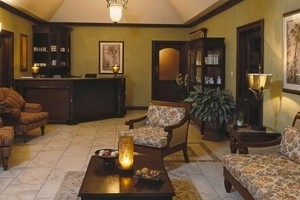 The Suite features a separate sleeping and sitting area, plus direct access to the golden sand beach. 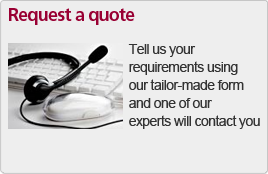 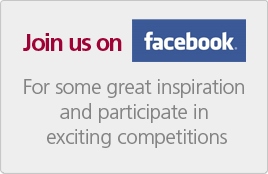 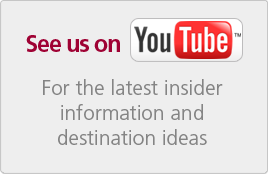 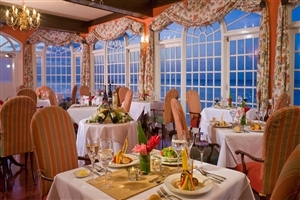 Bayside Restaurant - International cuisine. 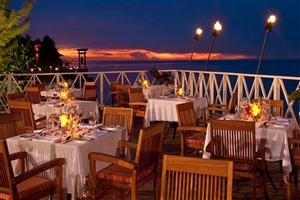 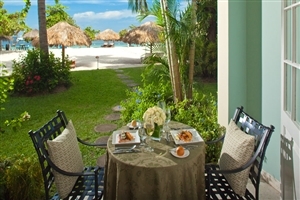 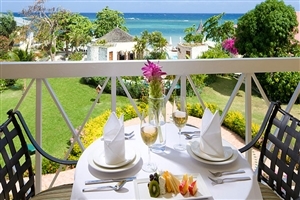 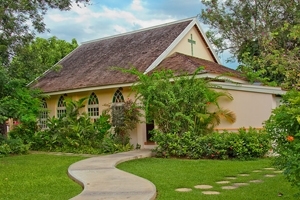 The Oleander Room - Jamaican restaurant with signature white-glove service. 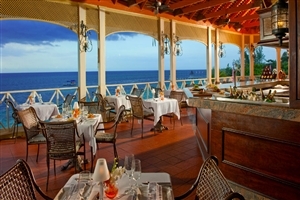 Cucina Romana - The resort's a la carte Italian restaurant. 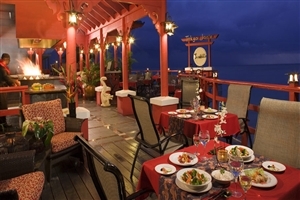 Tokyo Joe's - Two-tiered restaurant serving flame-cooked stir-fry dishes and Asian cuisine. 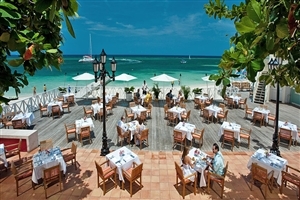 Stewfish Restaurant - Authentic Jamaican and Caribbean seafood. 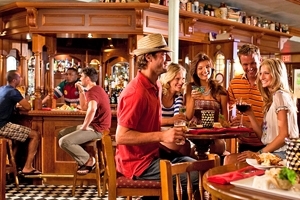 The Cricketers Pint - Traditional English pub with hearty cuisine. 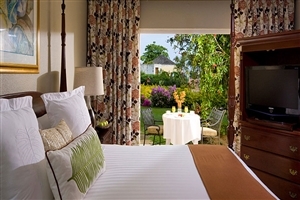 Cafe de Paris - Treat yourself to some of Paris's most delightful temptings at this relaxing hideaway. 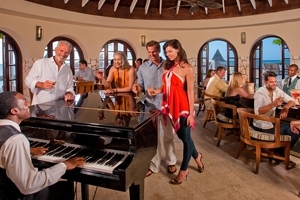 Dino's Pizzeria - Choose from a selection of topping favourites at this authentic Italian pizzeria. 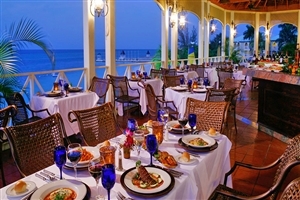 The Mariner Seaside Grill - Dine fine with a variety of grilled specialties at this beautifully located hotsot. 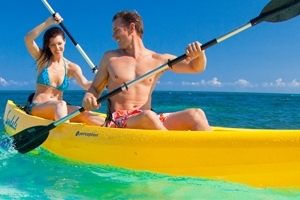 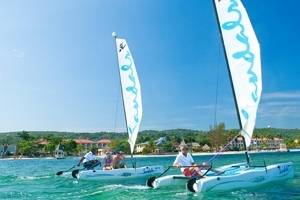 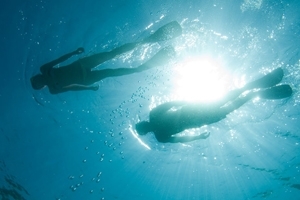 An impressive selection of facilities, services and activities awaits you at Sandals Montego Bay, perfect for those wishing to relax or stay active on their Jamaica holiday.